For flooding or tree emergencies, call (415) 485-3375 or (415) 485-3372. For all other emergencies dial 911. For downed power lines and power outage reports, call 911 immediately to report the location of a downed line. After reporting the downed line, call PG&E's 24-hour Residential Customer Service Center at 1-800-743-5000. Consider downed power lines still active. Stay away from the lines and keep others away from them. Be prepared for when – not if – the next emergency will occur. How prepared are you? Create an emergency preparedness kit with at least a three-day supply of non-perishable food and water for your home & office. Kits for vehicle road travel and winter weather evacuation go-kits are also advised. To plan, prepare and build a kit, please visit Ready Marin. Make a plan and practice it with your family and those who depend on you. Don’t forget about your pets! We do all that we can to prepare for wet winters, such as stockpiling sandbags and other supplies to respond to emergencies, inspecting catch basins and removing leaves from storm drains. We remove over 100 tons of leaves each year, but we still need your help to keep storm drains clear. When you hear there is a "Flood Watch" or a "Flood Warning" it's already too late to prepare fr the high water. Take steps now to protects your family, your neighborhood, and the environment! Dispose of yard waste and leaves by composting or using your green cart. There is no extra service charge for using up to two additional carts or paper bags – 32 gallons or smaller. You can also rent an additional 64-gallon green cart from Marin Sanitary Service. Don’t place anything in the street or in the way of a drainage system. If your home is in the path of runoff, keep plywood, plastic sheeting, and lumber on hand to divert water and debris. If your basement is subject to flooding, consider installing a sump pump with generator back-up. Don’t pour chemicals, paints, or other Household Hazardous Waste in areas where it might flow into the storm drain. Let us know by reporting any problems by email or phone at 415-485-3355. If your property can be protected by sandbags, consider getting sand and bags BEFORE the rainy season and stockpile as many filled bags as you think you may need. We provide residents with sandbags and/or sand on a first-come first serve basis. For best results, fill sandbags 1/2 full. After all bags are in place, a light sprinkling of water is recommended. This technique is only effective with burlap sandbags and will not work with plastic sandbags. Please remember that Station 55 is an active, 24-hour fire station. We ask that you keep driveways clear to allow emergency vehicles to respond as necessary. For additional information, questions, or concerns, call (415) 485-3372 during regular business hours. Find directions to the stations online. 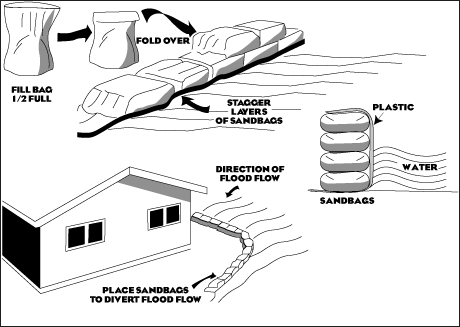 Fold top of sandbag down and rest bag on its folded top (see illustration below).It is important to place bags with the folded top toward the upstream or uphill direction to prevent bags from opening when water runs by them. Care should be taken to stack sandbags in accordance with the illustrations. Place each sandbag as shown, completing each layer prior to starting the next layer. Limit placement to two layers unless a building is used as a backing or sandbags are pyramided. Sandbags are basically for low-flow protection (up to two feet). Protection from higher flows requires a more permanent type of structure. Sandbags will not seal out water. When sand and soil-filled burlap sandbags are exposed for several months to continued wetting and drying, they will deteriorate. If bags are placed too early, they may not be effective when needed. CAUTION - Do not use straw or bales of hay in lieu of sandbags. They do not perform as well as sandbags and may be washed away. When the storm is over and you no longer need the sand bags, you may keep them for the following year or empty the sand in your backyard.